There really isn't much change from yesterday's predictions, however I do have a slightly "new" way of charting SPX which might be worth noting. Yesterday, I warned that a larger fourth wave bounce might be in the cards, and it seems likely that we saw all (or part) of that fourth wave unfold through most of the session. Not a bad call considering that the futures were down 47,000 points when I published the article. In any case, it's tough to say if the entire fourth wave completed yesterday, since fourth waves are nasty and unpredictable environments, much like the inner depths of Bernanke's beard. Based on the one-minute chart, I'm inclined to believe that at least one fractal did fully complete, suggesting the wave may be finished -- however, 4th waves are known to string several complete fractals together, so I can't be certain. In either case, I don't believe the final lows for the larger wave are in yet. It would look much better with new lows, and I've outlined a progressive series of targets on the chart below. The chart I really want to call attention to is the bigger picture SPX chart. It seems that just about every bear on the planet is watching the possible head and shoulders top which is forming in SPX. I want to point out that there are different ways to view it, though all of the charts I've seen are charting it with an upward-sloping neckline. There's absolutely nothing wrong with charting it that way, but I always get nervous when too many technicians are on the same page, and begin to worry about foul-play from the market. The market doesn't like to be transparent, so the bulls might throw in a curveball. Accordingly, I want to call attention to another way to chart the head and shoulders. 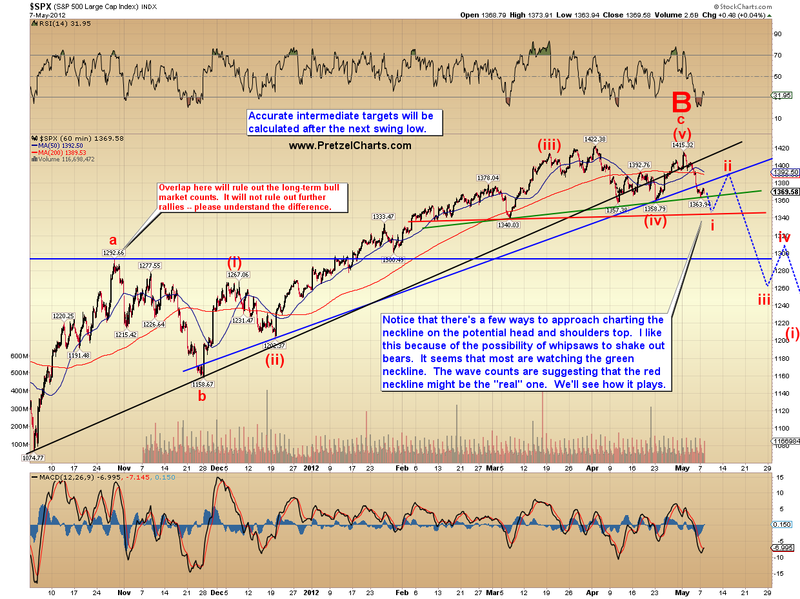 The wave counts suggest that the way I'm charting it below may in fact be "correct." We'll have to pay close attention to what type of action develops around the potential necklines. In either case, aggressive bears won't necessarily want to wait and see if my hypothetical is correct. But it's certainly worth being aware of the potential. Next up is COMPQ, which appears to be in a similar position to SPX, and looks like it needs to make new lows before any significant rally can get started. I also wanted to update CVX, whose chart just seems to get uglier everyday. I'm looking for new lows here as well, followed by a larger bounce, followed by me (and some of my readers, no doubt) shorting the living daylights out of it, followed by all of us living out our days explaining to our in-laws that, no, they can't have any more "small loans." At least, not until they pay the last one back. And finally, I want to call attention to the DAX, which did something noteworthy yesterday: it overlapped the red wave-a high, thereby joining the FTSE in ruling out the super-bullish long-term counts (which I ruled out a long time ago) with very high probability. It also appears to be in a similar position to SPX and COMPQ -- so the stars seem to be aligning for the bears over the intermediate term. In conclusion, the expectation is that there may or may not be a little more sideways yuck left in the market first -- my inclination is that there's not -- but either way, new lows appear highly probable. There are short-term targets listed on each chart, and I expect a decent bounce will emerge from one of the targets listed. We'll keep tracking the short-term structure as it unfolds. Trade safe. Reprinted by Permission C 2012 Minyanville Media, Inc. Morning PL - not exactly making money yet but hopefully will be in a position to donate from some profits soon (just trying to reverse losses to date). I think of it as paying for an education - will pay the educator as soon as I can :)! Good Morning PL...EXCELLENT article (just wanted to make sure you could see EXCELLENT). Bears are feeling good today I think. It was a great balance of info and humor....PLEASE WRITE AN EW BOOK!! !...F&P is frying my synapses. I read it in bed before I go to sleep every night, cuz it's so dry it relieves my sinus problems, plus it knocks me out like Propofol on Michael Jackson (...is it too soon?). Ya wouldn't sell a million of'em but it would save so many brain cells and possibly humanity...think of the chilluns. PL, Thank you for the update. "In either case, I don't believe the final lows for the larger wave are in yet." "In either case, I don't believe the final lows are in yet for the larger wave." LOL...I'm seeing an East Coast/West Coast thang here. if the EUR/US fail to take the 3010 it might fall lower, how do you see it? I'm seeing a potential inverted hs pattern from yesterday formed , which gives me a target in the 1380-1390 area ,, I believe that we will kiss daily MA50 goodbye at around 1385-1386 ,, then another move down. I see it as winding up for another big move down. 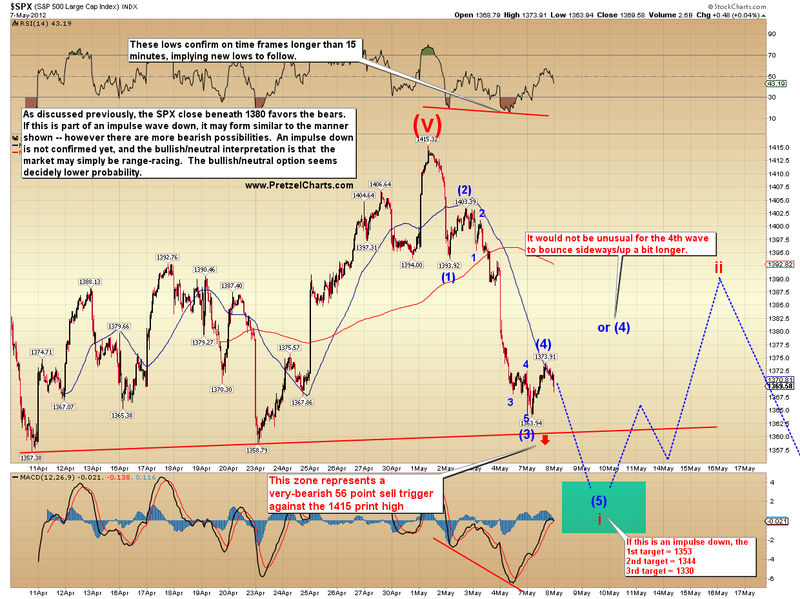 Brilliant observation re: SPX60 (2d chart) on H&S whipsaw. Remember July 2009 when all of MSM and widows/orphans were salivating over a H&S top? Not quite the same here, but there will be heads on a platter short term. hmm big move down...eur or us, anyways covered profits now at 80, went short on EUR last evening. Hi Sqwii. I think we may get that back-kiss eventually, but I think there's more selling first. Hence my suggestion of the "key" neckline being a possible misdirection... who knows. "Throw the horse over the fence some hay." Brilliant, PL! re: neckline ... "Off with her head!" Didja have to go there LOL....Ya keep that up I will end every sentence with either "Doncha know" or worse yet "awhile"...I expect no one other than you PL, to understand what I'm talking about. HOLY DINOSAUR BONES...bout time that POS was driven back underground. It went down 20,000 fathoms! looks like selling should end at 1354.8 spx from a 1=5 standpoint on 2 timeframes, both the smallest squiggles(think we're in 4) and from the wave that started 1415. DX is taking off, PMs are crushed. Let's watch see some nice Katzos today. exiting shorts or bad day for the bulls today? can you clarify what you think might be the bottom. thanks katzo! 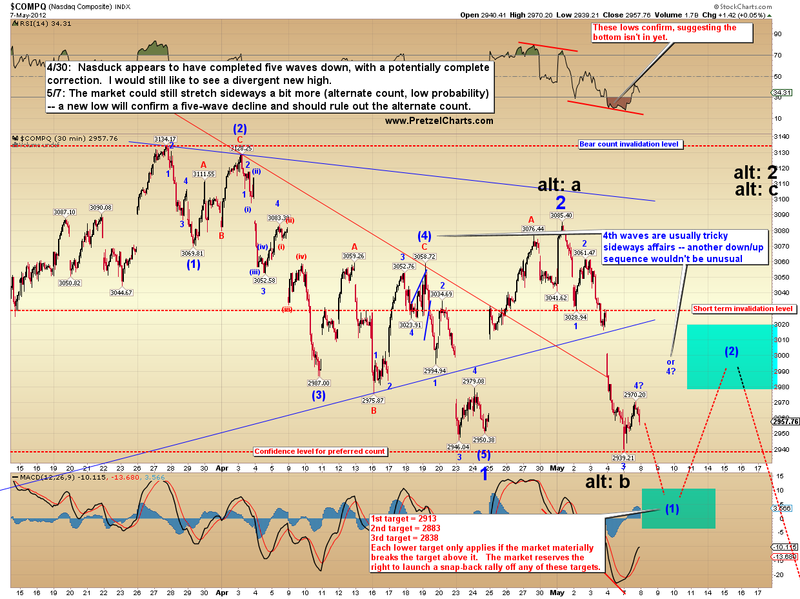 Could it be they are thinking b/c we are in w5 down and it could be nearing a possible end? I was looking at some longer term charts (decade) and they are just starting to turn down on the Stochastics, for example. Katzo7, You did it again!!! Most of my trades are done with my own work. Today, I continued to use my own strategy but you helped reinforce my convication on my trade. I will be donating to Mr. PL today because of you, PL, and PL's great community here. I am done for the day, but will have orders to open more VIX May Call 30 strike contracts at $.25. Thanks PL, Katzo7, and to this community here. yes, donate to PL so we can retain this professional (no trolls) and focused community. Thanx for you posititve comments. When there is lots of bullishness expressed widespread on the blogs, that's a contrarian indicator...time for a down. Pretzel ,, you see a move on SPX down to 1340 maybe ,, and then a bounce from there to form a right shoulder in a possible top hs pattern on SPX ? COMP on the Ichi Moku charts has bust straight thru' the Cloud and out the other side. This is baaaaaaad news for the bulls, that is if there are any left on here... Bob_E I hope you went short on MMM, down >3% in a few days, good call, plunged into the Cloud and almost out the other side... strong markets these. Strong bounce maybe? what this action does is to move us one step closer to the EW3 on the day being formed. We are moving into a strong EW3 down on longer term charts (not the day yet), and each day is a step closer to a pivotal change (no going back). Something in that ballpark, yes. Obviously, we'll have to play it by ear a bit, and if this decline starts accellerating, then everything prior was probably a nest of 1's and 2's. katzo, do you think we retrace that whole move up of the lows in ES yesterday? Good calls, hope you are making a killing! LOL You are forgiven...I just took off my sneakers/socks and threw on my boat shoes. absolutely, just look at today's action. Here in the UK the received published wisdom that a 5-10% shakeout is due and would be a good thing for the market. Gulp. Katzo ,, SPX potential bounce from 1340 to form a bearish top hs pattern ? We also have a potential breakdown targeting 1290-1300 next by Mid May before bounce ? Kicking myself for closing that 2nd 1/3 on CVX too early. Oh well, a triple is still okay... but a five-bagger would definitely have been better. Considering closing more here. Some people just can't learn the basic rule: Buy low, Sell high. I think moves like the one we are seeing today tend to prevail until the end of the session. The magnitude and breadth give an indication that we will be closing at the low of the day. Maybe a rebound will be short lived!!! Seeing some positive divergences on the very short time frames, but not much on the longer time frames. You got a chart from which support ? 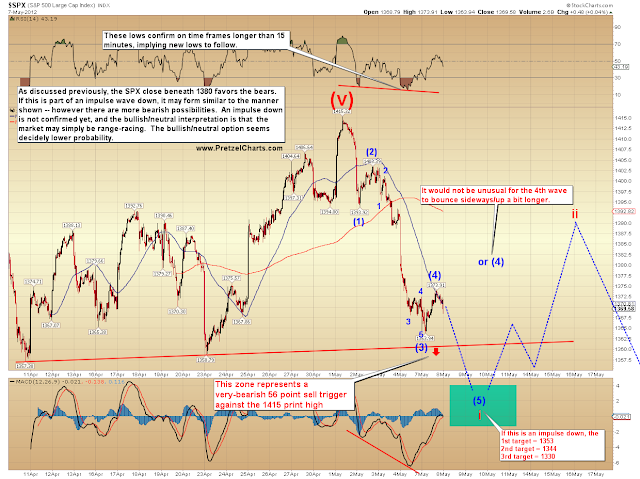 Market's already lost the 1357/58 zone -- the real test won't come 'til 1340ish. That's the bulls last line of defense. I got my Daisy Dukes on. That was my call heading into today... we'll see how it looks when we get closer to that level, assuming. I'm assuming you're talking about SPX 1340 from March 6th? You're gonna need something stronger than that LOL. Out of SPX put, wish I would have bought more. Just want to remind folks that there have been multiple times since the 09 bottom that the corrective C wave was just a clean five down. This is for illustrations purposes only. Damned Dutchies made me crazy when I was working the Ephrata ER. Ben Franklin wanted to put a wall up around Lancaster County....now I know why. katzo is it going to be a 180>>220 day again? No clue what this means or how the market would be expected to respond. Does a "cloud break" usually lead a crash? Is there a backtest? How does all this Itchy Moku stuff work, beyond the commercials I see advertising the creams to treat it? SPX stair stepped into the next H&S pattern. I'm looking for a back test of the broken neckline, probably into OPEX next week, and then a break to the measured target of 1310. For the ES traders here, take a look at this H&S that is setting up on the 4 hour with a neckline at 1340. Its measured move target is 1280 ES. Just saw 5 waves up in CVX, so could be starting some type of bounce there. i'm thinking an impulse bottomed ...i'm labeling 1 of C -- if correct, 2 of C could surprise bears in it's strength this week. So it looks to me like we've got a decisive breakdown through your red trendline, your green trendline, my 2011 high line, the bottom of the mid-April trading range and a complete entrancement of the now failed upside breakout of same... I'd still like to see a notarized letter from Ben Bernanke's beard. Looks like from here we'd like to see a failed backtest of one or more of those previous support levels then it's all aboard the crazy train? Said . . . bare toes extend over the ledge, she is gazing down 26 floors. . .
apprehension. Taxis wiz past. . . . .
be the back end of the day pattern I recognized"
This is a test right here. 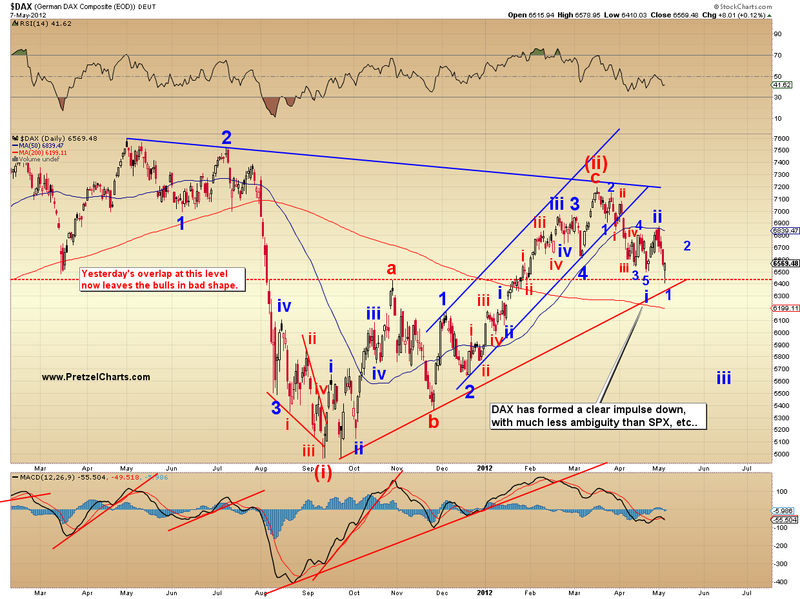 Got a 3-wave rally so far on SPX. If the bulls can break any more upside there (above 1353), expect a bigger bounce to unfold. Could be sharp, too. If they can't, then the down move continues. No sir, you're not reading the chart right. No break on the red trendline. Rally time, closed (most) shorts on CVX and ES. Will reshort higher. Have to give credit where credit is due. you mentioned pink flamingos earlier... you could star in your own version of the movie?! Here's the chart updated with the price action. Hasn't quite reached the red trendline, much less broken it. Are we still around a 4-point SPX/ES differential? Could 1355 be A of II? Yep, important for the bulls to hold it here. wtf, long ES 1348.50 -- tight stops. Oops. Must's had a little color blind moment there. I actually read it right but I meant green and blue, not green and red. I stand corrected. I would never look that good. That move down from 1351.50 looks like a five on a tick chart. How come he has a look on his face like he went long yesterday? 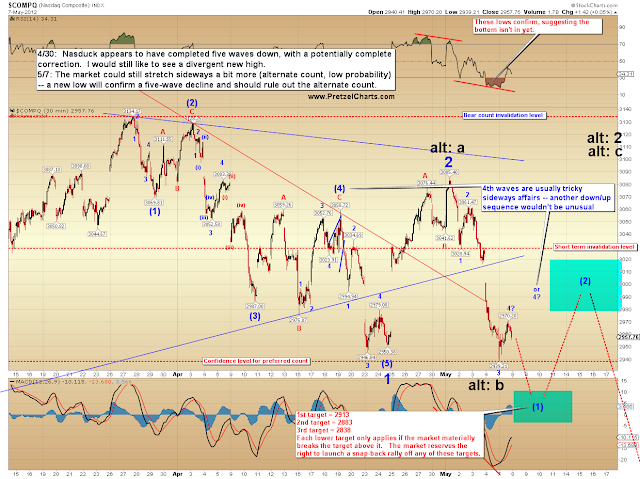 Out if SPX breaks 1349, but won't take another position right now. Did well enough today, not interested in giving my profit back on weirdness. agreed...held my TZA through that bump, might dump it if $RUT hits 782 again, but then again...maybe not. doesn't it look like a young "Beard"? oh....another funny guy...wuddya think ya own the b-l-.....oh yeah. I'm curious what you saw at this level. I didn't see it. done...I even tried to comment...very unlike me. gunna be a bery bad day for the bullz. . .
Look at your, Mr. Bigshot! Hi PL. You're welcome for the donation. I'm recovering from some bone-headed moves but still learning alot from your site. Had to get out for awhile due to the losing trade count and also to help a family member recover from surgery. Thank you for all your hard work negotiating with MV. For all you RUTrs out there, it looks to be hanging on to the trendline PL pointed out yesterday for dear life. I've been cash only for awhile now lickin' my wounds so to speak. If it breaks the trendline, I may just jump back in. Good luck to all. This is quite an exciting day! I'm done for the day. I wouldn't even risk play money on this nonsense. I was just watching ES though and thinking it might be wanting to replay Sunday night for the primetime viewing audience. 1352 could be the trigger level again to get the bulls a-snortin'. Thank you and I'm sure He will too. Still tending wounds myself...only 1/4 position from my usual. It is fun to watch though. "The charts pretty much tell the story. First up is a very long-term chart of the S&P 500 (SPY) (SPX)..."
That's actually done intentionally. It's tied to their ticker, and they get more search results from SPY than SPX. I know, it bugs the purist in me, too. PL, any chance this sideways noise is wave 2 of the fourth wave we were expecting today with the first move up from the bottom being wave 1? PL - it would be to your advantage if all the comments here -- appeared at the MV location. With blogs, often it's the comments that engage viewers, not to mention the excellent user-provided content from geniuses such as myself. That's my hot tip of the day - and CAT too! lmao -- not sure how to make that fly. 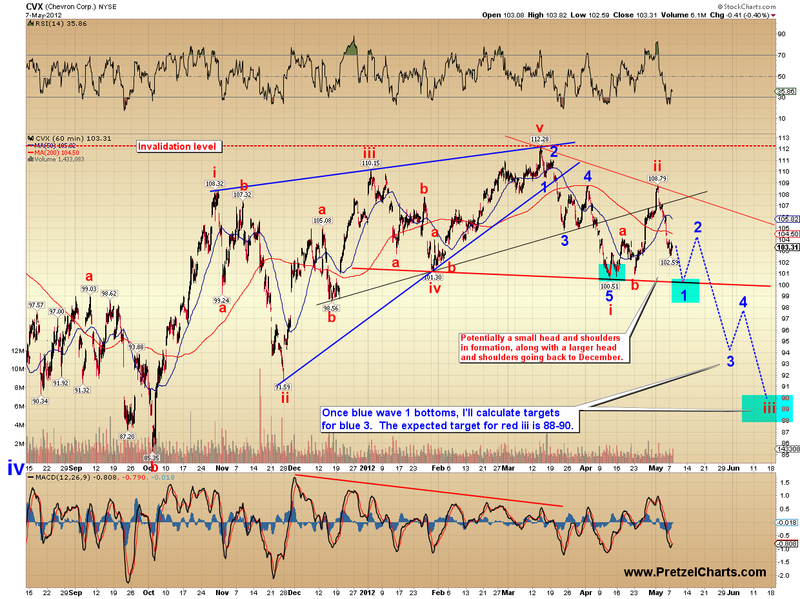 not just a partial retracement of the upmove off of this am's low? just trying to learn a little katzo crystal ball method;) its scarily accurate! 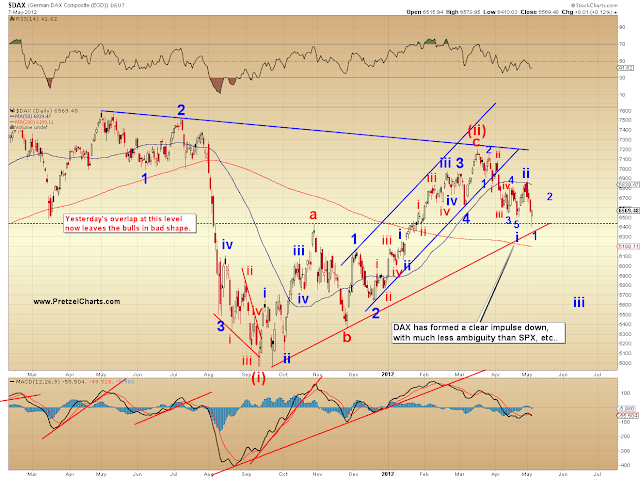 within the next 1/2 hour we will see if there is a possibility of an up, or if we continue down, charts set up that way. I suspect more down to come EOD. Closed longs at 1350 ES for +1.5... looks like more up prolly coming, though.